Grassroots efforts to raise awareness of rising sea levels — WorksOnWater Works On Water Blog Blog focused on artists who examine, move over, look at, work with, journey on, use metaphorically, or create new connections to water, rivers, lakes, oceans, or boats. An OpEd in Palm Beach Post by Olivia Nedd. South Florida is at the forefront of the climate crisis. From sunny-day flooding to rapidly intensifying hurricanes and toxic red tide, South Floridians have seen it all. How we respond to the climate crisis is the most defining question of our time. The UN Intergovernmental Panel on Climate Change and the federal National Climate Assessment have relayed the significance of the climate crisis and the urgency for the world, our nation, and Florida to take action and work to reduce greenhouse gas emissions. The science is loud and clear: our time is running out. We have 12 years to reduce carbon pollution and prevent the worst impacts of climate change. So why aren’t we acting? It feels like we’re at a standstill with folks being all for climate action and those that won’t even utter the words climate change unless claiming it’s a hoax. This only furthers the growing divide among Americans. Sadly, this comes at the extreme detriment of working Americans who are focused on solving problems. We need another way to discuss issues that don’t devolve into turf wars and false-outrage. And climate change is perhaps the best example of a problem almost entirely consumed by the argument instead of the issue. A new way of communicating is needed. I’m thrilled to say a local Miami artist may have discovered a way to raise the issue with quintessential Miami flare – leave it to Miami. Critically acclaimed environmental artist Xavier Cortada is using art as a platform to raise awareness about rising sea levels and to engage South Florida communities to take action towards solving top climate issues. Cortada uses what he calls socially-engaged art to make bold statements about the inevitability of sea level rise. He re-purposed campaign yard signs, which are symbolic of the political divide in our country, to depict rising sea levels and the impending risk to South Florida homes. 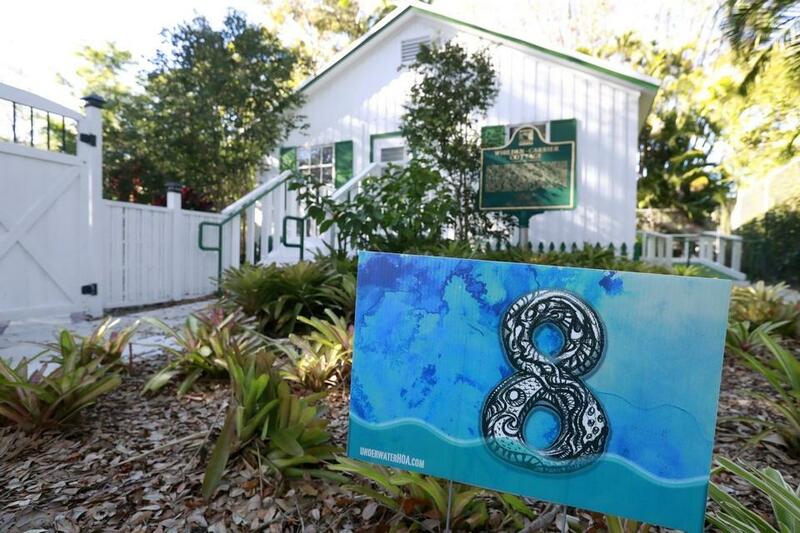 Residents of the Village of Pinecrest have been working together since February in what we’re calling the Underwater Homeowners Association at the Hibiscus Gallery in Pinecrest. The Underwater HOA, offers a space for residents to come together to collaborate on solutions to climate issues impacting their community. As a group, the Underwater HOA, discusses issues of sea-level rise, the upcoming vote on the Pinecrest Water Initiative and ways they can use art and educational tools to engage the community. The Underwater HOA is open to all community members and is not restricted to property owners or any specific city. For too long, I have called on legislators to act: writing letters, making phone calls and participating in marches. But time passes and while conversations may be had and ideas may be circulated, no action is taken. We are long past the time for talking. I am hopeful that elected officials will lead on climate issues in Tallahassee but until then, the Underwater HOA gives us an opportunity to work on these issues from the ground up. This type of grassroots participation on a local level is the key to our democracy and I hope more Floridians will get involved. Art is a great way to strike up a conversation about climate change among neighbors and the community. It doesn’t matter the socio-economic status, race or gender. Nor does it matter what a person’s political affiliation is. What matters is the shared threat we all face: climate change. It is how we act and respond today that will ultimately make the difference. Editor’s note: Nedd is the South Florida Lead Organizer for Florida Conservation Voters. Read the article in the Palm Beach Post.